One motivation behind Bean Thinking is to explore those connections that can be found when we stop to really look around us. Whether your interest is in history, philosophy or science, something in a café will prompt a train of reflections that can lead to interesting and surprising thought journeys. This is surely true for anybody in any café, if we just take the time to slow down. But, I admit a prejudice: while I had heard great things about the coffee in MacIntyre, when I had glanced in from the bus window, I saw the scaffolding seating arrangements and wooden surfaces that can be a type of design found in many new cafés. So I worried. Was it going to be hard to ‘see the connections’ in MacIntyre? Would I end up with a great coffee but a challenge to my assumptions about the ubiquity of connectivity? Fortunately, I needn’t have worried. The two lovely coffees that I have enjoyed at MacIntyre gave me plenty of time to really savour both the coffee and my surroundings and I was wrong in my assumptions from the bus window, connections really are everywhere. The café itself was a delightful find. Watching other customers while drinking my long black, it seemed that everyone was greeted by a cheery “hello”. Many people were clearly regulars, which is perhaps unsurprising for a friendly café with good coffee in a busy area. The scaffolding and wooden seating also works in the space at MacIntyre, giving a strangely relaxing feel to the café. The café itself is rather narrow, with the seating on one side and pastries/ordering queue on the other. 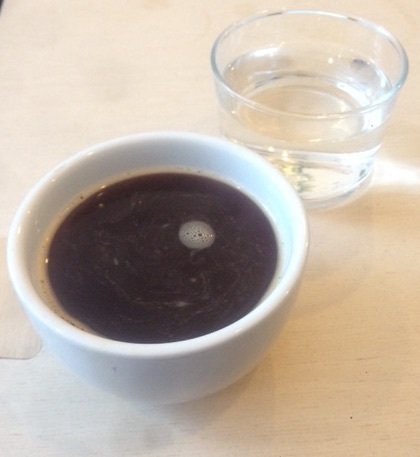 Tap water was delivered with the coffee, without my needing to have asked for it. Good scaffolding also has good connections. Plant and light at MacIntyre. MacIntyre may also be a great spot if you are into people watching. Amidst the general busy-ness, I could eavesdrop on conversations about the latest coffee news and the rise of artificial intelligence (these were two separate conversations!). Perhaps the conversations were particularly noticeable owing to the acoustics of the wooden walls and the narrow, small space of the café. 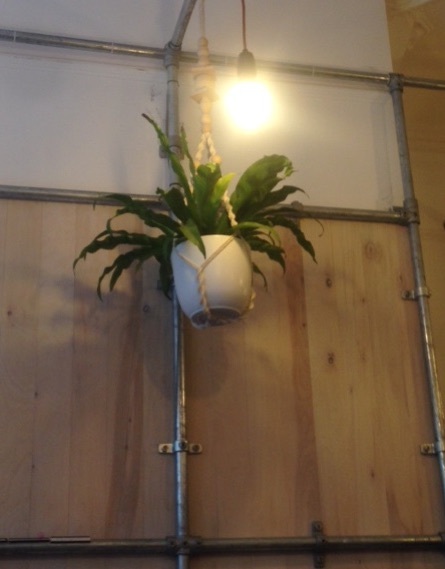 At various points around the café, plants hung from the scaffolding. Some of the plants were spot-lit, which caused me to wonder whether the light that the plants were receiving was optimal for photosynthesis. The menu was projected onto the rear wall of the café, which was also decorated with hexagons, an immediate connection to graphene. But then, in my coffee cup, the significant crema on the coffee showed evidence of amazing thermal convective motion together with turbulence. The coffee itself was very sweet with nutty overtones but the movements of the crema reminded me of cloud formation in thunderstorms. Although thunderstorms didn’t make it to the thought train of MacIntyre, another form of surface motion suggested a connection to another, unusual, feature of this café. You see, MacIntyre is a cashless business, no cash is accepted even if you’re only buying a long black. Most customers on my visit paid with their contactless cards. The idea of a cashless society is one that has obvious advantages for both the business and the government/economy (whether it has such obvious advantages for the consumer I will leave as a point to be debated). While some countries are attempting to move to a more cashless economy, for a business to be entirely cashless is somewhat innovative. Even though MacIntyre is not the only café to go cashless (Browns of Brockley is similarly cash free), it has to be one of the first cafés to do so. Coffee and water on wood at MacIntyre Coffee. Could you increase the returns on your investments by understanding the movements on the surface of a cup of coffee? What is the connection between this and the surface movement on my coffee? Well, it is not just at MacIntyre that a café has supported an innovation that has (or may) change our economy. 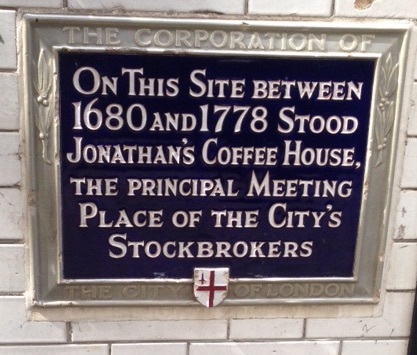 Just over three hundred years ago, Jonathan’s Coffee House in Exchange Alley was a place of similar innovation, though there it was a customer rather than the coffee house itself that gave the change. It was at Jonathan’s in 1698 that John Castaing published a paper twice a week detailing the latest stock prices titled “The course of the exchange and other things”. Recognised now as the origin of the London Stock Exchange, how stocks are priced and how their prices vary with time are subject to intense mathematical modelling. Although now, these models can be extraordinarily complex, the base of many of them share a mathematical model with the movements on the surface of your coffee cup, Brownian Motion. The site of Jonathan’s in Exchange Alley. Seen while on a Coffee House tour last year. Brownian motion is the phenomenon in which small particles of dust, or coffee grains on the surface of your coffee move in a random way as a result of collisions between the particles and the molecules in the liquid. First described in detail by a botanist, Robert Brown in 1827, the experimental evidence in favour of the molecular-collision explanation of Brownian motion came in 1910 with Jean Perrin’s careful experiments (that have featured in The Daily Grind previously). The maths behind the explanation relies on the idea of the ‘random walk‘ in which each dust particle is ‘kicked’ in a random direction by the molecules in the coffee, the consequent motion being frequently described with reference to a drunkard attempting to get home after leaving the pub. However, as this concept of the ‘random walk’ was being developed for molecules in a liquid, it was simultaneously being developed to model the movements of stock prices by the mathematician Louis Bachelier. Bachelier’s model of stock prices turned out to be the same as the model of Brownian motion, but both developed independently. As yet, it is unclear (to me at least) whether there is a link between cashless payments and some of the maths in your coffee cup but, MacIntyre would be a great place to contemplate this as you sip your brew. Never succumb to prejudices, on which note please do let me know what you think of cashless payments, a great convenience or an invasion of privacy? 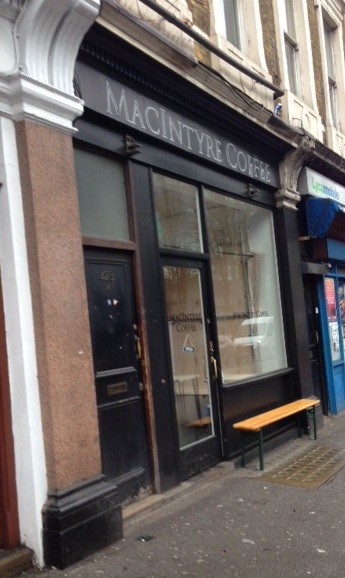 MacIntyre can be found at 428 St John St, EC1V 4NJ.